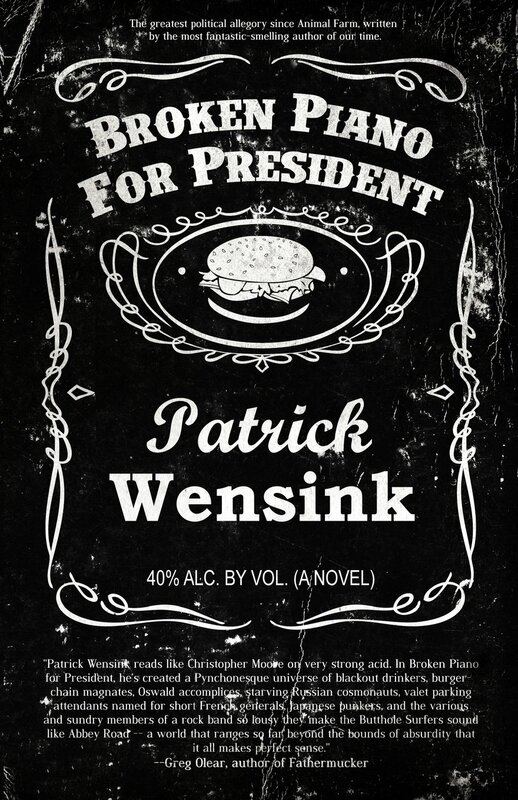 Patrick got a letter in his inbox from Jack Daniel’s. They are, apparently, not impressed with BROKEN PIANO FOR PRESIDENT’s artwork. Below is a portion of the letter. Stay tuned for more legal news. This entry was posted in Broken Piano for President. Bookmark the permalink. 22 Responses to Goodbye Beautiful Cover Art? I wouldn’t lose too much sleep over this. I doubt if a big company like Brown-Forman would really bother going after a small press book like yours. It’s probably not worth it to them to pay lawyers three or four hundred bucks an hour to fight something like this, that won’t really hurt their brand name anyway. Cease-and-desist letters are usually just a scare tactic. I wouldn’t lose too much sleep over this. I doubt if a big company like Brown-Forman would really bother fighting against a small-press book like yours, and paying lawyers three or four hundred bucks an hour to do so. Cease-and-desist letters are usually just a cheap formality that are used to scare off the easily frightened. IANAL, but they would probably win a case against you quite easily. The cover looks like someone scanned a label and did some minor photoshopping. You could ask politely and offer to credit them, but they probably don’t want to be closely associated with the story of a blackout drunk. The cost on their part is minimal, and corporations live for CYA stuff like this. The lawyers are on retainer. They’re a sunk cost. OTOH, if you drum up a backlash on the Intertubes, you might be able to embarass them. But you have to get sued first. Is it really worth the risk? Thanks for the distraction from the writing I should be doing! Wow. I should start a support group. The cover looks to me like a shopped scan of the label. 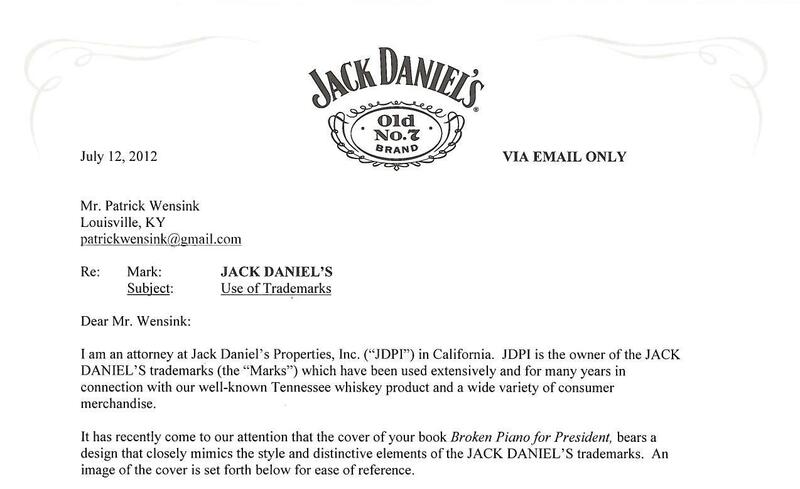 Technically, because it does not directly parody Jack Daniel’s, they have perfect legal ground to stand on. Also, I read the rest of the letter as published elsewhere, and they did it in a pretty classy way without being dicks about it or making unreasonable demands. How lame can you be to not show the whole letter where they only ask the cover be changed if the book is ever reprinted AND they offer to help pay for it if the author decides to do the redesign now. Pretty lame, is the answer. His first post about it leaves out 2/3 of the letter. I guess to drum up sympathy. I agree that Jack Daniels was very kind about how they handled this. Also, they have lawyers on retainer JUST for this reason so I wouldn’t count on them not pursuing this if you don’t desist. It was a good cover while it lasted but now it’s time to get those creative juices flowing and come up with an alternative. And take their financial help for the change! Very simple.